These healing stones are perfect for Pisces! Pisces you are the last of the great zodiac, and your placement was no mistake, you are highly evolved emotionally and the wisest of all the signs. Your complex nature is constantly in flux and you can take on traits of all the eleven signs before you. Your element of water puts your intuition at an all-time high and there is no doubt that you my dear are an old soul. Click Here to check out other zodiac signs and their crystals! Your caring nature sometimes causes you to put the needs of others before you own, the healing crystal Blue Goldstone can assist you, Pisces, in standing up for yourself. This stone also brings Pisces an uplifting protective energy. Amazonite encourages sun sign Pisces to have clear and honest communication and helps people to understand the signs true intentions. Amazonite: An amazing healing stone for Pisces! Aquamarine helps you to connect to your watery element and can help keep Pisces organized and aware. This stone also promotes peace and helps to align Pisces with their true emotions which they can often times get lost in. Rose Quartz gifts Pisces with the self-love and self-care your sign can sometimes forget to give itself. It also promotes you to show the same kind of compassion to others. Moonstone helps to connect Pisces with their inner wisdom and intuition. It is a stone of mystery and mysticism and can help you integrate those things into your everyday life. Pisces biggest challenge is remaining grounded, you love to float into the clouds and create your own reality. Bloodstone helps keep your feet on the ground while also tuning you into your intuition. This stone is able to stimulate your desire to act in the present moment while also keeping out negative or unwanted influences. Use these stone dearest Pisces to harness your spiritual gifts and inner strengths! Snag this Moonstone healing necklace here! Snag this Bloodstone piece here! Grab this perfect Pisces Rose Quartz Pendant here! Get this aquamarine necklace to complement your Pisces energy here! Click the photo above to purchase this pendant. Travel is hugely affected by Mercury Retrograde. One of my friends always locks her keys in her car, gets a flat, whatever it may be at least 3 or 4 times during the 3 weeks Mercury is off. Personally, I experience a difference in traffic & weather conditions when I need to get somewhere. They say it is best not to travel during Mercury Retrograde but if its something you can't avoid, try rocking a Smoky Quartz or hanging one in the rearview mirror of your car. Personally, I have one hanging in my car no matter what the status of Mercury may be. Smoky (or smokey) Quartz is a great protector against negativity in all forms. Ancient & metaphysical Lore tells us that Smokey Quartz is the ideal stone to use for protection during travel. It protects against road rage, traffic, weather conditions, other bad drivers, accidents, and problems with the car itself. Click the photo above to view this Aquamarine pendant on etsy. Miscommunication and misunderstandings are much more likely to happen during Mercury Retrograde. (Good luck to those of you in relationships & brace yourselves...) However, there are so many crystals to help protect you from these mishaps. Aquamarine aids in the flow of thought and words, to help you fluently express yourself and what you need to say. It also has a very gentle calming factor. Amazonite can help you express your personal truth and can also calm overemotionalism. Amazonite is also a good stone for listening to others because it can help you discern the truth in what people say (Mercury Retrograde makes people a little difficult, but this stone can help you realize the goodness behind the words.) Every person is different and will react differently to certain crystals; so if you don't resonate with one of these crystals, check out other throat chakra stones: Blue Kyanite, Sodalite, Labradorite, Blue Opal, Chrysocolla, Blue Chalcedony. Check out a selection of Amethyst pendants by clicking the photo above. 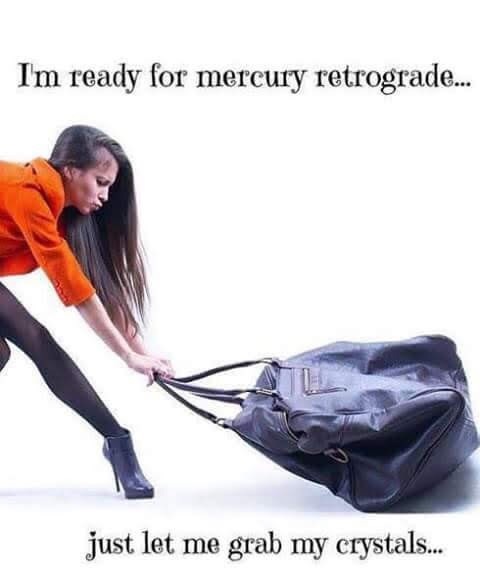 They say not to make any huge decisions, purchases, or commitments during Mercury Retrograde. However, I completely disagree. Of course you should think over your decisions carefully and obtain as much information as you can, I think if you are confident with the change you are about to make: GO FOR IT. Use a stone for intuition to guide you on what the best option is: Fluorite and Amethyst. Click the photo above to view these Apatite stones for sale. Whether its because the dreaded retrograde makes us feel a little scatter-brained, travel issues, or because this odd planetary shift can send us to the strangest of places - plans are definitely subject to change. In my case, plans changing last minute causes me tons of unneeded anxiety & stress, so I have recently started carrying a Prehnite with me, a stone that helps you go with the flow. Conversely, you may want to carry a Blue Apatite which is a wonderful stone for helping you with time management. Click the photo above to read more about this Quartz (& Moldavite) wrap. This one drives me crazy, but beware of technology malfunctions during this phenomenon. This could mean your cell phone or computer randomly crash, or everything gets erased; whatever it may be - you can definitely blame Mercury for this one. A simple quartz crystal has strong influence on technology and can ensure that everything is running properly. A safer idea is to back up everything and press save over a dozen times!! Overall, Mercury Retrograde can affect each person differently. Depending on what your star sign is, where the phase falls in the sky, and thousands of other factors, you may not experience the same as another. I say that positive thinking is the best form of protection but you may also want to carry these protection stones: Smoky Quartz, Black Tourmaline, Black Kyanite, Labradorite. To become more in tune with the planet Mercury check out these crystals: Citrine, Agate, Opal. Good luck to you all! You might already have most of these crystal essentials, but what are you missing?